Enjoy the contrast between the blue and white at the Tenguyama Mountain ski area! 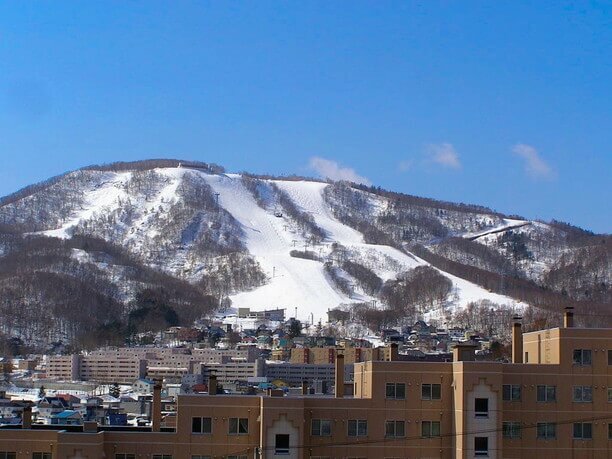 is considered the best skiing in Hokkaido(北海道), Japan. This area produced a number of Olympic athletes. 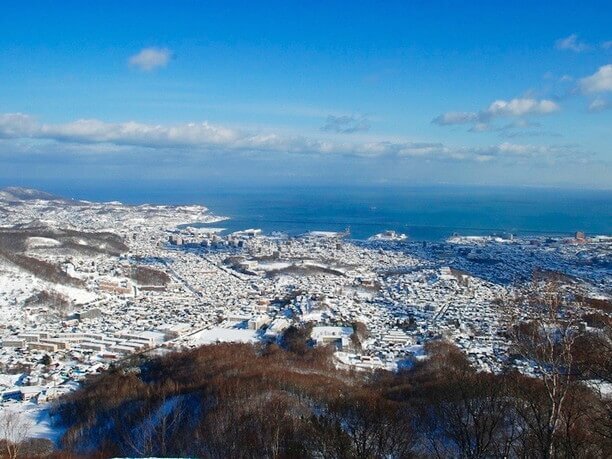 On a sunny day you can really appreciate the beautiful contrast between the blue and white of Otaru City and the sea. The view at night is also very beautiful. 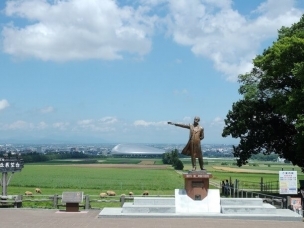 In fact it has been named one of the 3 best night views in Hokkaido. 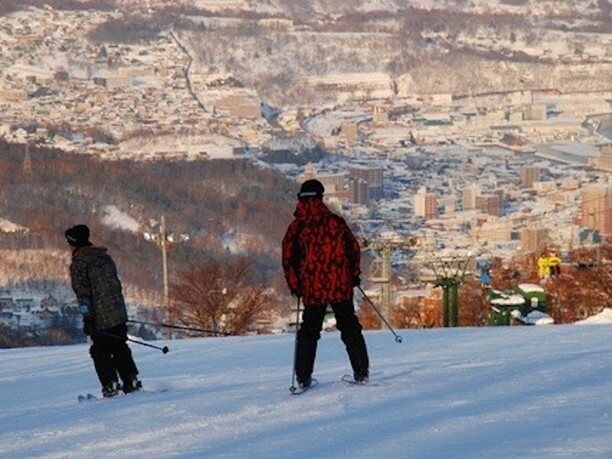 It is also an appealing ski resort because it is rarely crowded. 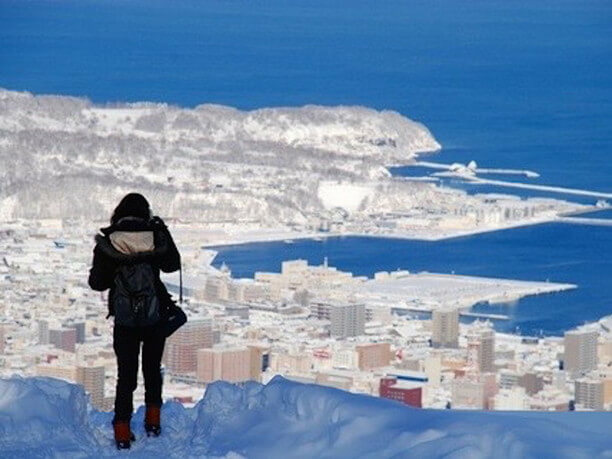 Exhilarating runs while enjoying the views of Otaru! From the top there are six runs that travel down the Mountain. You can take the tram up to the Summit from the foot of the Observatory. 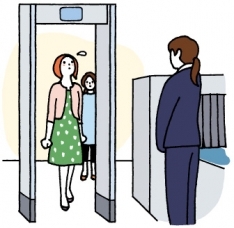 All short lifts to and from the Summit meet at the observation deck. From the observation deck you can make your way down the rest of the mountain. Even beginners can enjoy this long line course from the top. The total distance is about 1200 yards and takes you through relatively peaceful woodland course. 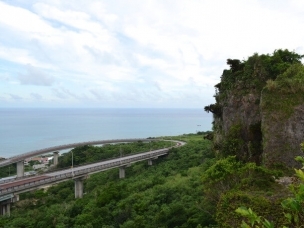 So, you can enjoy a long run while enjoying the atmosphere of the beautiful scenery. Tengu Mountain is a unique ski resort with mostly moderate runs. 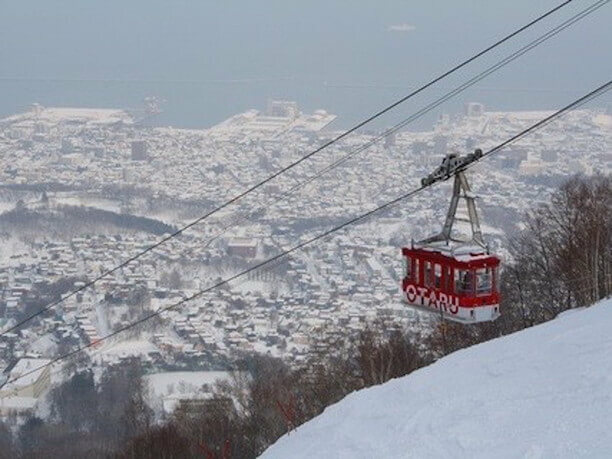 These “family runs” are safe for anyone and offer the opportunity to admire the Otaru views while cruising down the slopes. Night skiing is also available (4:00 PM to 8:00 PM). Olympic athletes helped create the “Tengu wall” run. it is almost a cliff! Kentaro Minagawa(皆川賢太郎), one of Japan’s Olympic athletes helped create it and practiced on this course. So if you are confident skier, come give this slope a try! We highly recommended purchasing the snow play set (1600 yen). It includes tramway round trip tickets and either snowshoes or ski shoes. With the ski shoes or snowshoe you can walk in the in deep snow. It is a very pleasant walk in a white world. Also available are sled rental (1 hour 400 yen) and tube rentals (500 yen/hour). You can enjoy playing in the snow at a reasonable price. 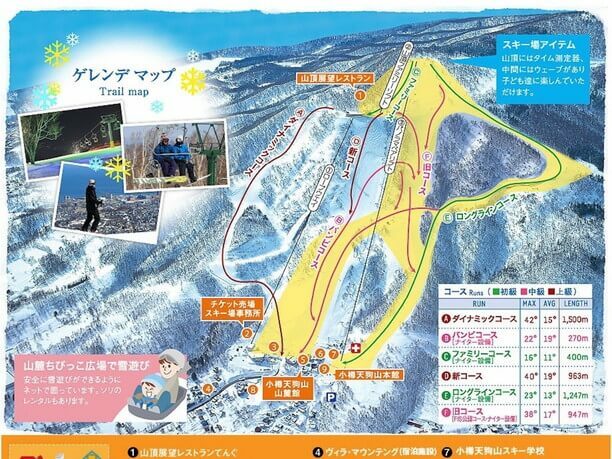 They also have gear rental for people who want to try skiing or snowboarding (set 6500 yen). “Sancho restaurant at the Summit has an authentic western-style menu. 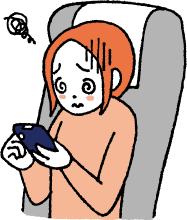 You can purchase aerial tramway round trip ticket with drink tickets and meal vouchers as a set (tram tickets and drinks 1,400yen, with meal ticket 1,800yen). 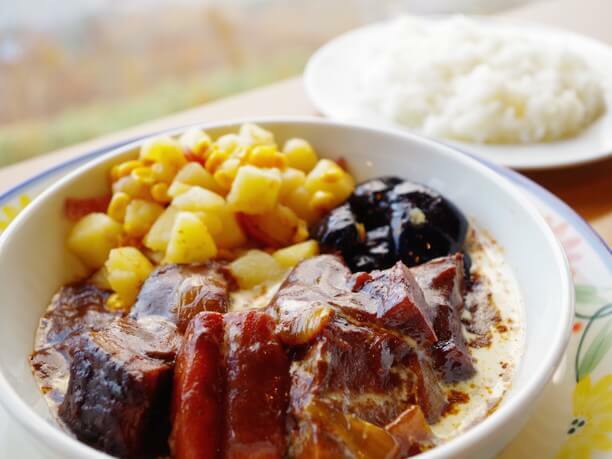 The stewed tongue is very popular (1300 yen)! 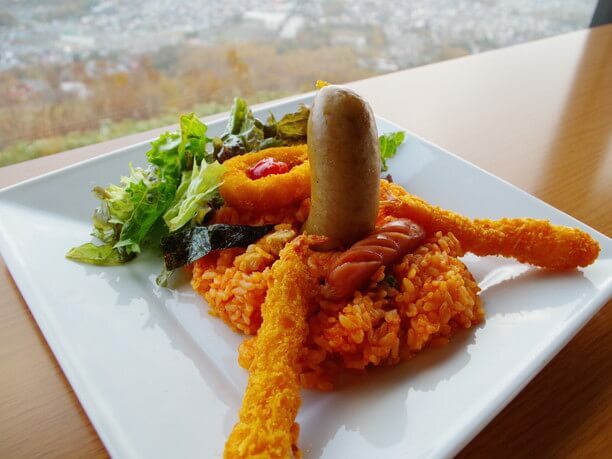 Also very popular is the Tengu rice plate (1,000 yen). It is a favorite of the children but many adults try it as well. The aerial tram is available to ride at night even if you aren’t skiing. 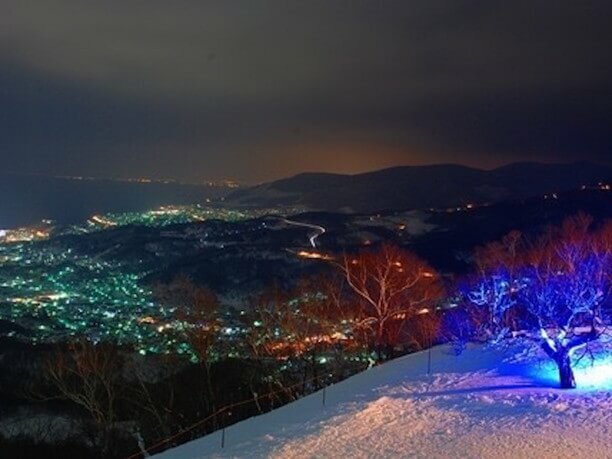 It is a great way to see the Otaru night view (1140 Yen round trip for tram). During the “Otaru winter event” there is a variety of venues in the snow and you can see the Otaru Snow light path. Have fun! The Summit's long line course is ideal for the whole family, even beginners..
Legend says that if you can find Hananade tengu san and touch his nose, your wish will come true . Aerial tramway round trip tickets and bus fare is sold as a set for 1480 yen. We recommend you buy the set in advance at the terminal. Summit restaurant has soft serve ice cream (350 yen). It is a real treat to eat soft serve ice cream in a warm restaurant. A Hokkaido unique luxury you will want to enjoy. This area is a wonderful place to drink, eat and play.